Keurig receives high ratings because of the quality, convenience, and ease of usage of their coffee makers. It caters to every need of their customers. They have hundreds of varieties of K Cups to choose from, which adheres to every taste of every person in the world. And if using K Cups doesn't adhere to a certain individuals (due to availability, expenses, environmental concerns), Keurig offers reusable filters that allow them to use their own grounds with their Keurig Brewer. 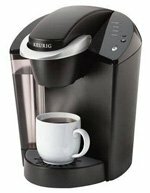 Therefore, when it comes to single cup coffee brewers, Keurig is probably at the forefront because they address to every concern and every need that every single cup coffee drinkers have. There is no doubt that Keurig make a great range of machines - if you are a Oprah fan you might have caught the fact that she has a couple in their offices!